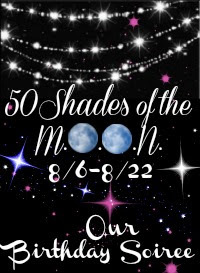 50 Shades of the Moon Giveaway Event ARV $1700 12 Winners! We have twelve awesome prize packages up for grabs in the 50 Shades of the Moon Giveaway Event! Please read through the full list of prizes in each package! This is going to be a great giveaway event! Good luck everyone! People every where are different! We all have our likes/dislikes; We have our favorite hobbies and interests; We look different and dress different; We are parents, children, siblings, and friends. This is what makes up the Make Our Own Network team of bloggers! We are the “Strange Kids on the Block” because we do things differently than any one out there.For our first birthday, we want to celebrate individuality and independence from following the norms. This giveaway event will be all about exactly that! Anything goes – prizes vary from adult products to childrens’ toys to travel gear to entertaining gadgets and more. This is a HUGE Event with 12 possible “Personality” Packages to choose from! This Giveaway Ends August 22nd, 2013 at 11:59 pm EST. Open to the Continental US. Make Our Own Network solely organized this event and I received no compensation for this publication. My opinions are 100% my own and may differ from your own or even those stated in this post. ALL OF THE PACKAGES LOOK GREAT, IF i HAD TO CHOOSE, I WOULD WANT #10! I would probably like the “‘Out of a Magazine’ Home Designer” package best because I like the necklace. I like one or two items from just about all of the packages. I am especially interested in package number 7 because of the makeup. I love them all but package 3 really speaks to the foodie in me. Package 12 – gotta have those ben wa balls. I love the Home Entertainer package because we entertain all the time and host book clubs in our home. Many of the prize packs are awesome for me. If I had to choose one, I would go with #9 because I really want an Oragami Owl charm necklace. I like package #6 the best! My daughter is really into tutu’s right now! What a great array of prizes! I would love the Tupperware prep and chop. I do a lot of cooking and this would really cut down on the preparation. The Weightloss Champ because I need the help losing weight! My favorite package is #9 because I’ve always wanted an Oragami Owl necklace and would love to try Pink Zebra to make my busy home smell better. I like the The Foodie Package because I love trying new foods. I would like to try out something from Pure Romance. I always seize the opportunity to spice things up. I would like the Foodie Package. I like Package 11 the most…unique prizes that I definitely don’t have! I like Package #3 the most and am most excited about it. I love cooking and anything that helps me cook up amazing recipes, I’d love to win! I am most excited about Package #8!!!!!!! I would love to win this one because I love Origami owl necklace, I also love simmer pots and gift certificates are always awesome in my book. I chose http://www.aluckyladybug.com/2013/08/cloud-b-twilight-carz-review-and.html because my son loves and is crazy about cars and this is awsome gift for him when he is sleeping or in night. Nice giveaway! All the items are really nice, but my favorite is #2, because I really want to win the Tupperware – Chop ‘n’ Prep container. Thanks! Pkge # 2 would be great!